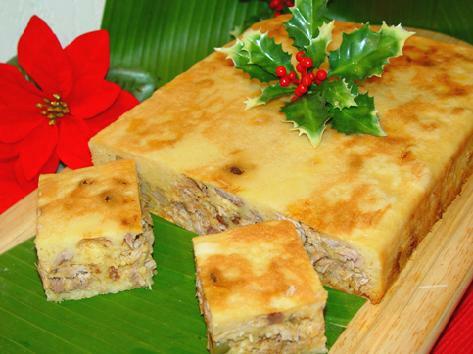 The Curacao Outsider: Curacao Krioyo Foods, (The guide to what not to eat). I was thinking, "You really need to write again", but what to write about. Then I remembered Krioyo food, and all the fun it makes me think off. Warning the following is filled with facts and so has the possibility of teaching you something. If you do not wish for this just pass the part that is in red. 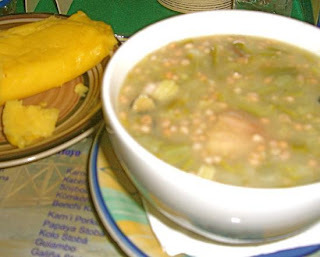 Local food is called Krioyo (pronounced the same as criollo, the Spanish word for "Creole") and boasts a blend of flavours and techniques best compared to Caribbean cuisine and Latin American cuisine. Dishes common in Curaçao are found in Aruba and Bonaire as well. 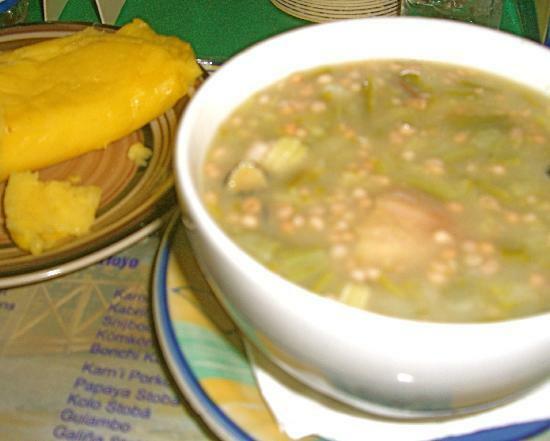 Popular dishes include: stobá (a stew made with various ingredients such as papaya, beef or goat), Guiambo (soup made from okra and seafood), kadushi (cactus soup), sopi mondongo (intestine soup), funchi (cornmeal paste similar to fufu, ugali and polenta) and a lot of fish and other seafood. Now back to our regular scheduled program. So what are these foods really to the outside person, what do you think about when you never saw "stobá" or "Keshi Yená" or even the mysterious "Guiambo". Well, let us find out! First up we got the all famous "stobá". Yes, it looks like they just took a big scoop from the compost heap, added whatever meat the dog did not eat and threw it in a pan filled with some kind of liquid. It smells like wet dog food mixed with old spice and some vegetables. This "delectably" made "food" is "eaten" by most local people. It is also sold to unsuspecting tourists that believe they are getting "food". What amazes me most about this "food" is that you can make it from any kind of meat and it will still look (And taste) the same. The mystery this carries should have been recorded in folklore. Unfortunately I do not know enough of the folklore of Curacao to go into that, but by the looks and smell of this food there clearly should be a story called "Stobaba" (Bad pun I know). One day Tico and Laura where walking in the mondi at Westpoint. Tico, Laura said, I'm hungry. Tico looked at Laura and said, no problem. Tico grabbed some dirt, cactus, a potato he had under his shoe, a dead lizard and made stobába in his shoe." The rest of the story should be known by now. Before I leave the subject of "stobá". WARNING: Do not be fooled by anybody saying "I" or "My mom, can make it really good, you will love it". This line will ALWAYS be said when you say "I do not like stobá". On to the looking good "Keshi Yená". The dish that looks like a giant stuffed cheese is, a giant stuffed cheese. "Keshi Yená" is basically cheese stuff with all kinds of things, usually chicken and some vegetables. You could eat a small amount of this and survive, eat to much and it will induce a cheese coma. Cheese comas are known to be more intense then any magical brownie can give. So go for it if you want, but I warned you. Also be warned, this food is usually best eaten hot, but for some reason most places serve it cold. This makes it hard to eat, and even heavier on the body. I am not kidding at the amount of cheese that is in this thing. 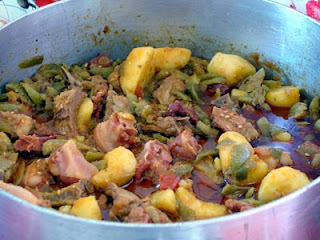 If cows knew about this dish they would want some kind of royalty program to be put in place with the Curacao people. Unions would start up filled with cows wanting their justice for the work spend on the cheesiness that is "Keshi Yená". This dish is usually a main course and goes well with rice. It one of the few local foods I would recommend to eat, but with caution. Next up we got the most famous "Guiambo". It's green, it's snotty and slimy. When your spoon hits it, it will disappear like Indiana Jones in quicksand. This is the type of food that when other people eat it, you do NOT want to be next to them. It is a dish you slurp and splash and try to get into your mouth but almost crawls back out. It is the stuff Slimer from ghost busters is made off. It is whatever comes out of the nose of a child. It is just disgusting to look at and I would strongly advice to only try this if you do not mind the way snot feels in your mouth. The taste I've been told rains from sweet and tangy all the way to salty and spicy. Really, just eat this food when you are alone. I'm not joking, it really does look, feel and slurps like Slimer. Come to think of it, this most likely what "Guiambo" looks like after it has been left in the fridge for to long. 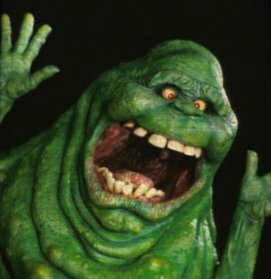 Most likely they got the idea for Slimer from eating "Guiambo". So thank you "Guiambo" for looking so damn disgusting. Well friend, for now I am no longer hungry. What I learned today? Never, ever, go by the assumption that food will be good just because somebody said the line "You have not yet tried". See you at the Snacks! Stobá, the Antillian stew, is delightful. Like Mári said, maybe you probably best stick to simple American fast food! The cuisine in Curaçao is mouthwatering and so diverse. Love it! I have never read a blog about food written by such a narrow mind. I agree with Mari, stick to MC Donald's!